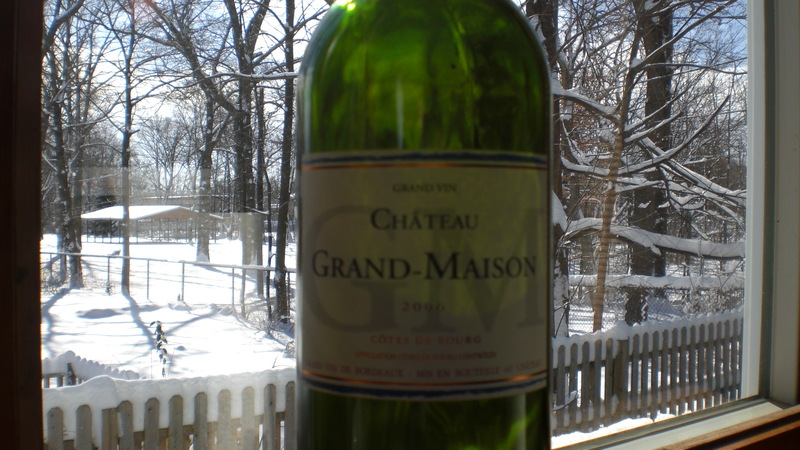 The 2006 Chateau Grand-Maison Grand Vin Bordeaux is a show-stopping red blend, a powerhouse combination of Merlot (84%), Malbec (12%), and Cabernet Franc (4%) from the Cotes de Bourg region of France. It was also an amazing drink with which to celebrate Winter Storm Nemo as it bracketed the region with nearly a foot of snow, wind, and wintery madness. A gift from my oenophile brother, I pulled the cork and was blown away by the mix of blackberries, plums, and spice contained in this pale green bottle (special thanks to my lovely and talented photographer for the photo here). This Bordeaux (a chateau’s top wine) we opened not only to celebrate warmth and comfort in the middle of the storm, but also a visit from a dear friend who was in town with us for the evening. You don’t need a special occasion like this to open the Chateau Grand-Maison (at least the 2006); you make a special occasion when you open this gem. We had it first with fun appetizers (e.g., shrimp shumai and spicy California roll) and then with fist-sized top sirloins, served with a mushroom and pan-seared butter sauce along with spring greens and a citrus vinaigrette. Rosemary roasted potatoes completed this fantastic feast and made for the perfect blend of herbs and rare-cooked cow–and red wine. Ironically, that was very close to the meal we were enjoying too. The clear highlight of the night, though–other than the great company–was the 2006 Chateau Grand-Maison Grand Vin.